All the data sets from tree rings to ice core to weather stations originally showed rapid rate of warming from 1900 to 1940 followed by a rapid cooling trend lasting until the 1970's. The cooling trend observed since 1940 is real enough, he says, but not enough is known about the underlying causes to justify any sort of extrapolation. Particularly dangerous would be any attempt to generalize from even shorter-term experience, like the bad weather in 1972 and following years, to prognosticate any future weather patterns. On the other hand, the cooling since 1940 has been large enough and consistent enough that it will not soon be reversed, and we are unlikely to quickly regain the "very extraordinary period of warmth" that preceded it. But little did they realize proponents of AGW would remove that 40s warm blip and eliminate the cooling trend as computers allowed them to alter entire data sets. The AGW proponents manipulations were revealed via their own emails that showed they were conspiring to eliminate the warm blips seen in all types of data in order to create a trend of steady warming that was more in line with their CO2 theory. Such data manipulation would be considered horribly dishonest and abhorrently detrimental to science in any other discipline. So why do believers in catastrophic climate change accept such reprehensible dishonesty??? "Phil, Here are some speculations on correcting SSTs to partly explain the 1940s warming blip. If you look at the attached plot you will see that the land also shows the 1940s blip (as I'm sure you know). So, if we could reduce the ocean blip by, say, 0.15 degC, then this would be significant for the global mean -- but we'd still have to explain the land blip. I've chosen 0.15 here deliberately. This still leaves an ocean blip, and i think one needs to have some form of ocean blip to explain the land blip (via either some common forcing, or ocean forcing land, or vice versa, or all of these). When you look at other blips, the land blips are 1.5 to 2 times (roughly) the ocean blips -- higher sensitivity plus thermal inertia effects. My 0.15 adjustment leaves things consistent with this, so you can see where I am coming from. Removing ENSO does not affect this. It would be good to remove at least part of the 1940s blip, but we are still left with "why the blip". Skeptic Tony Heller aka Steve Goddard has generated a graph to illustrate how pre-1975 temperatures trends were adjusted. The multidecadal oscillating global temperature trend is exactly what scientist illustrated with Quality Controlled USA data that was not "homogenized". For those who read scientific papers, the graph below is from Shen (2011) "The twentieth century contiguous US temperature changes indicated by daily data and higher statistical moments." Last edited by Jim Steele on Fri Dec 23, 2016 10:15 pm, edited 2 times in total. You know Trump is going to cut the payroll, so you won't be getting a check any more. Gawdzilla Sama wrote: You know Trump is going to cut the payroll, so you won't be getting a check any more. You and boobo never could debate real science. So instead you offer stupid conspiracy theory snippets. Alarmists are the worst deniers of evidence and climate truths. Clearly none of our resident paranoid climate alarmists can defend the cabal of AGW scientists' self evident conspiracy to change climate data that reveals natural oscillations. The paranoid simply deny the truth in order to hold on to their stupid catastrophic beliefs. Here is the trend based on instrumental data for Greenland showing a warm blip in the 30s and 40s , a warm blip those dishonest scientists conspired to eliminate in the average. The data is from peer reviewed research published by climate scientists at Los Alamos research labs: Chylek 2006 titled "Greenland warming of 1920–1930 and 1995–2005". 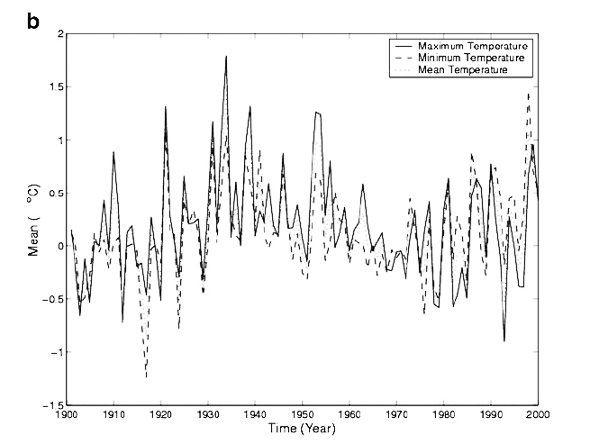 They also reported the warming rate from the 20s and 30s was much faster than the recent cycle of warming. Doublethink means the power of holding two contradictory beliefs in one's mind simultaneously, and accepting both of them. The Party intellectual knows in which direction his memories must be altered; he therefore knows that he is playing tricks with reality; but by the exercise of doublethink he also satisfies himself that reality is not violated. The process has to be conscious, or it would not be carried out with sufficient precision, but it also has to be unconscious, or it would bring with it a feeling of falsity and hence of guilt. Doublethink lies at the very heart of Ingsoc, since the essential act of the Party is to use conscious deception while retaining the firmness of purpose that goes with complete honesty. To tell deliberate lies while genuinely believing them and to forget any fact that has become inconvenient, and then, when it becomes necessary again, to draw it back from oblivion for just so long as it is needed, to deny the existence of objective reality and all the while to take account of the reality which one denies - all this is indispensably necessary. Excellent quote. Doublethink is pervasive here. It seems wherever we look there is a 1940s warm blip that defies CO2 warming theory. Here are the Greenland temperatures observed and published in "Greenland Ice Sheet Surface Air Temperature Variability: 1840–2007"
It really shows up in the high quality station data. Which is probably why they were discussing in the emails how to get rid of it, and how much to lower the past temperatures. It's a difficult task, they have to be careful not to create an obvious issue when data sets that have been modified don't match each other. Or worse, how can the ocean data and land data be different? The doublethink can't be used for actual science, because belief doesn't change physics. Indeed Robinson. 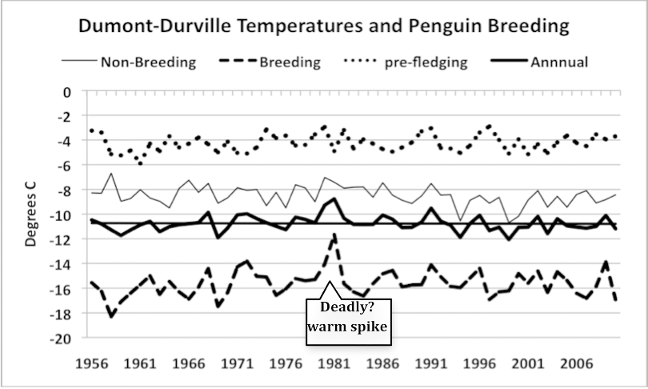 The warm blips show up in nearly every data set. They didnt fit Wrigley and Jones and Mann's theory, so they conspired to get rid of all warm blips. Personal attacks in this one, too. Locked until Tuesday. It was actually the discussion (revealed by the climategate emails) about "getting rid of" that made me skeptical about global warming, or rather what the alarm ringers had been saying for decades about it. Along with "hide the decline" and Trenberth talking about the record cold and snow in Boulder, it all was too much to ignore. So I started looking at the actual data, and the entire story fell apart. The University of East Anglia’s Climatic Research Unit published Attribution Of Polar Warming To Human Influence in Nature. http://www.nature.com/naturegeoscience . 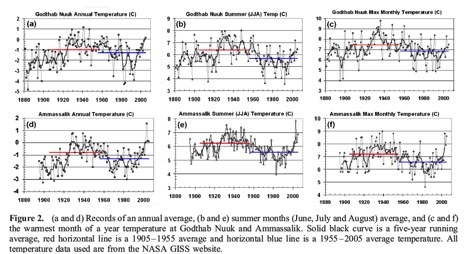 But their model results shown below, failed to simulate the high heat during Arctic’s earlier natural warming (black line), a warming climate scientists called “the most spectacular event of the century”. Their “natural models” grossly underestimated the 40s peak warming by ~0.8° C (blue line) and when CO2 and sulfates were added the models cooled that warming event further (red line). Skeptics have offered an alternative explanation that is consistent with ALL the evidence. The 40s warming can be explained by increased transport of warm Atlantic water and additional effects from changing pressure systems. In contrast climate scientists like Phil Jones at East Anglia’s Climatic Research Unit conspired with others to get rid of the warm blip so the "evidence" would better match their models of climate change. The science is not so exact. What does that hockey stick mean? bobbo_the_Pragmatist wrote: Oceans don't blip. The science is not so exact. What does that hockey stick mean? I will interpret your irrelevant reply and lack of refutation , that you agree with the point of the post that climate models' have failed to simulate natural climate change. 1. No one ever said oceans blip. Oceans transport and ventilate heat the cause air temperatures to blip. 2. Indeed science is not exact. The erroneous hockey stick was a classic example. Models that were wrong by 0,8 degrees, the amount of proclaimed global warming, suggests we should not trust the models. Your CONSTANT ERROR is on HIGH DISPLAY.... sadly now with something extra: baseless obvious denial of what is right in front of you. Ha, ha....say, thats not "new" at all. ie: I correctly ((and accurately as all can see)) everything you say..... as demonstrated below. JIm Steele wrote: ,,,,that you agree with the point of the post that climate models' have failed to simulate natural climate change. The predictive models run backwards are not precise enough to identify every vagary in THE WEATHER. But the model correctly predicts many other larger more general events: earth getting warmer, sea level rising, snow and ice retreating, ocean currents weakening, storms stronger, droughts longer, weather patterns changine etc. JIm Steele wrote: 1. No one ever said oceans blip. Whaaaa? Slipping a bit there JS. From your own quote in your post that you put in BOLD: ", if we could reduce the ocean blip..."
JIm Steele wrote: Oceans transport and ventilate heat the cause air temperatures to blip. No. Oceans and atmosphere constantly interact with one another and with the land as well. Its NOT as you imply a one way street. I know: its complicated. JIm Steele wrote: The erroneous hockey stick was a classic example. the Hockey Stick has been confirmed many times over. It appears in the very graphs you posted. Science does not do well when ignoring or even disputing the obvious. In fact............ such a process is not even Science. I now stop short of the ab hominem. Here are some speculations on correcting SSTs to partly explain the 1940s warming blip. If you look at the attached plot you will see that the land also shows the 1940s blip (as I'm sure you know). So, if we could reduce the ocean blip by, say, 0.15 degC, then this would be significant for the global mean -- but we'd still have to explain the land blip. They were referring to blips in sea surface temperatures (SST) and land suface temperatures. And exactly because the land and ocean interact they were discussing how to alter the data so that both the land and SST altered data would maintain a reasonable relationship. You failed to understand what they were discussing but then act like only you understood that interplay. You then fabricate that I was arguing for a one way interaction. Your constant personal attacks are bad enough without you making up what I have argued. That said because the upper 10 feet of the ocean holds more heat than the entire atmosphere, any changes in ventilation and transportation of ocean heat are the dominant drivers of temperature changes. It is also hilarious that you defend the failed model that failed to simulate the warm Arctic blips of the 30s and 40s. The model I presented was only about Arctic air temperatures. Different models are used to explain the different things you list and most of the models have also failed to simulate those changes. Some models correctly simulate some portion or regions of change while others fail completely. Dont cherry pick just the ones that fit catastrophic beliefs. 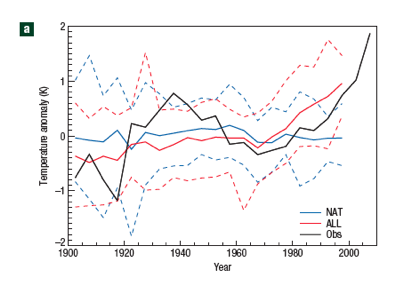 For example suggesting droughts are longer now is utterly false. You need to read about the 100 year megadroughts over the past thousand years. And bout 6000 years ago the Sahara went from being green to being a desert. It happened with low CO2 and a global cooling trend. CO2 models can not simulate tht change. Standard practice is to test a model's reliability by hind-casting the model and observing how well the model simulates KNOWN climate changes. Failure to do so signifies a model's incompetence. Furthermore if it fails to simulate the known past, we would be fools to trust it future predictions. Your attempt to apologize for failed models, suggesting failure to simulate DECADES of past climate change by calling it "vagary in THE WEATHER" shows how far you stray from real science. Is a "blip" a climate change? So the question is why do consensus climate scientists discuss the Arctic? Why do they use declining Arctic sea ice as evidence to support CO2 warming? And why do AGW believers accuse skeptics of cherry picking or irrelevancy when skeptics simply demonstrate a more parsimonious alternative interpretation that is consistent with all the evidence, that melting Arctic sea ice is best explained by natural climate oscillations. To argue climate scientists can discuss the Arctic, but skeptics can not, is merely a method of suppressing honest debate and dismissing contrary evidence. The skeptic interpretation may prove to be wrong. Nonetheless it must be refuted with evidence, not suppressed or dismissed. JS: do you agree that natural and man made inputs both affect climate? Assuming so, don't you have to include BOTH in any analysis? Note: all the IPCC models are BASED ON the natural variation as best as can be understood....THEN they compare and look at whats going on. WHATEVER you look at and measure today is a combo plate of natural and man made. Of course both are potential contributors to climate change. 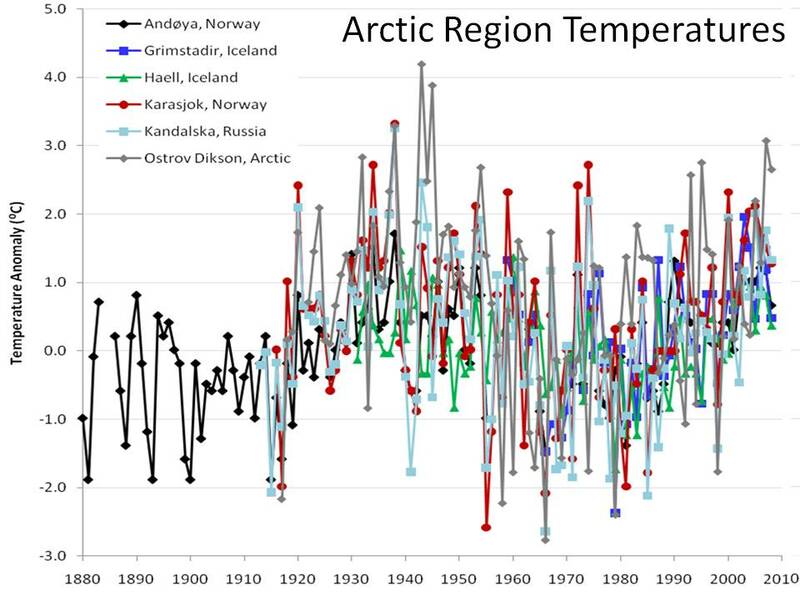 As shown above, climate scientists run a model that just looks at only natural variability. As you can see above from their results their model failed to simulate past natural climate change. My analyses have done the very same. The failure of the climate models to simulate the 30s and 40s is due to the fact that climate models do a very poor job of simulating natural oscillations and have admittedly failed to adequately incorporate currents that transport heat into the Arctic. Being a biologist I was aware of the oscillations that drove warm water fish into the Arctic coinciding with the loss of ice in the 30s and now. The climate models were driven by increasing amounts of CO2, which could explain recent warming but not past. So they "cherry picked" just the recent correlation. The climate scientist assumed the difference between natural and CO2 driven modeled temperatures is due to CO2 warming. However if it was truly the oscillations of intruding warm Atlantic water driving the loss of sea ice, then also by subtraction, whatever contribution CO2 has added to Arctic warming is greatly reduced and perhaps negligible. Of course this alternative explanation evokes certain predictions, that will test how robust the alternative explanation is. While CO2 theory predicts and a sea ice death spiral and ice free summers by 2030 (some predicted earlier loss) the natural oscillation suggests the ice will rebound as the transport into the Arctic slows down. JIm Steele wrote: Of course both are potential contributors to climate change. No....both by necessity are what make up climate and the changes thereto. Nothing potential about it. I don't know at what level of fine prediction a model has to hit in order to be considered valid. Meanwhile...........worldwide............ sea level keep going up. bobbo_the_Pragmatist wrote: No....both by necessity are what make up climate and the changes thereto. Nothing potential about it. I don't know at what level of fine prediction a model has to hit in order to be considered valid. Of course it is potential. We do not know how sensitive climate is to CO2 and iis a matter of ongoing debate. We do know natural variability has historically altered climates and results in heat waves and cold waves, floods and droughts, growing and shrinking glaciers. Many of the attribution studies compare past variability to a current event such as a heat wave. If the heat wave is within the bounds of natural variability, they conclude there was no effect from global warming. To simply claim CO2 must have an effect is not a scientific argument, but a statement of belief. I also suggest instead of chanting sea level change and interjecting into every post, why dont you start a thread on sea level change and state your argument why sea level change is conclusive proof of CO2 warming. As i have told you before, there are many factors that can contribute to the change and great uncertainties with the way we measure the change. And as I linked before EUropean satellites reported a declining Arctic sea level. So.... your scientific skepticism includes agreement that co2 IS a green house gas but its sensitivity may be zero.... or close enough to zero to be dismissed as an article of faith? So..... what natural process is causing sea level to rise? Any scientific study that presumes a given level of CO2 sensitivity, and fails to be open to all ranges of possibilities from very high to very low sensitivity is biased and will never accurately distinguish between natural variability and CO2 driven change. As stated a few times, the IPCC admits sensitivity will is low in the tropics and high in the polar regions. Sensitivity varies by region. That's why most climate scientists and myself examine regional changes. In my early research on wildlife in the northern Sierra Nevada its was clear there was very low sensitivity as maximum temperatures had not surpassed the peak warming in the 30s and 40s. Also as stated before, there is no consensus on the Antarctic's sensitivity to CO2, with 50% of the experts finding no effect. Again in stead of sniping, start a thread dedicated to sea level change and state your argument why sea level change is your conclusive proof of CO2 warming. As i have told you before, and will only discuss again in such a thread, there are many factors that can contribute to the change and great uncertainties with the way we measure those change. And as I linked before European satellites reported a declining Arctic sea level. 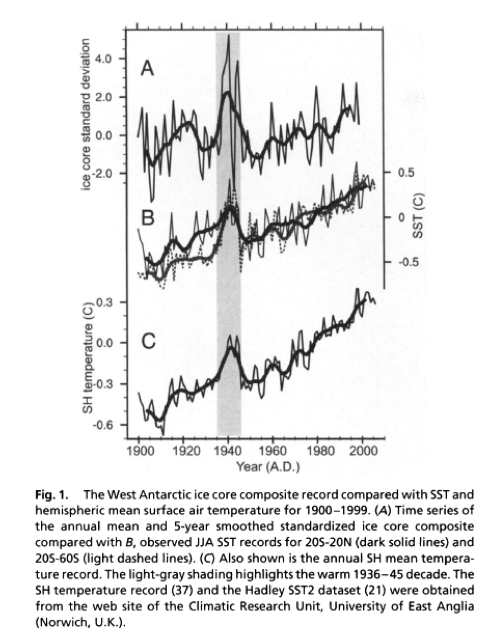 Ice core from base Antarctic Peninsuala also shows a peak warming in the 30s and 40s (graph A), with very little warming over the past 3 decades . bobbo, stop posting personal attacks. Gee Pyrrho: either you've become overly sensitized..........or .......... I've become rather mindless in my critique? "got ya" has a friendly vibe to it ...in my corrupted book. Pointing out "procedural error" on JS's part is not a personal attack: it is "analysis and critique." Its too quick to notice, but I've grown tired of JS's attack on the chimera of mathematics and the proxy of the whole by way of cherry picked evidence and have stopped responding. I note most members of the forum decline to participate.... course that could always be partially me, mostly him, and the rest of the universe? You know what is remarkable? I very much think of you as "The Man in Black." Very authoritative. I can't respond to Science Denying pretenders with any less hostility than I last displayed..... so, indeed, I will stop. The internet will just have to proceed without my corrections. Just one small piece of evidence from one part of the solar system (cherrypicked some would say?) changed the scientific view of the solar system from geocentric to heliocentric. Gaileo's telescope allowed scientists for the first time see that Venus went through phases like the moon, and thus its orbital placement according to the geocentric model was wrong. In climate science there many contradictions challenging the CO2 warming theory, yet the faithful, simply dismiss them as cherry picking, a tactic that runs counter to and defiles the scientific process. Pyrrho wrote: bobbo, stop posting personal attacks. Thank you Pyrrho! Deleting personal attacks sets the correct tone. Either we discuss the science, or else. As everyone understands, attacking the arguer instead of the argument, only defiles scientific debate. Let's just hope the US government doesn't delete climate data. I downloaded the EPA 2015 report this morning but there is only so much time I have and there is so much information. bobbo_the_Pragmatist wrote: Gee Pyrrho: either you've become overly sensitized..........or .......... I've become rather mindless in my critique? "got ya" has a friendly vibe to it ...in my corrupted book. Pointing out "procedural error" on JS's part is not a personal attack: it is "analysis and critique." I fully understand that this topic results in passionate defenses of various positions, but it's really quite simple: the behavior in this subforum pissed me off, and that is never good, especially if I've previously had to issue warnings and take other administrative actions. So now I am stricter than I'd prefer to be, until folks can demonstrate that they can discuss these matters without the fallacies of irrelevance. I don't care about the purported personal failings of the participants. I care about the issue and how society plans to deal with it--or how it plans to not deal with it, as the case may be. The personal attacks are a waste of time and effort, not only for the person who posts them. Pyrrho wrote: Let's just hope the US government doesn't delete climate data. I downloaded the EPA 2015 report this morning but there is only so much time I have and there is so much information. Removal of publicly-funded climate data appears to be a valid concern. Word now is that US government scientists must submit their work to politicians for review before it is published. The need for independent data collection and subsequent independent analysis thus becomes more crucial and essential. If the agencies become privatized, it becomes that much more essential. I have most of the available data on my hard drive already. Nobody is going to delete the actual data, and even if they did, it exists in the original locations. And in many other locations. Pyrrho wrote: The need for independent data collection and subsequent independent analysis thus becomes more crucial and essential. If the agencies become privatized, it becomes that much more essential. Indeed independent reviews and analyses have always been essential. Such reviews and analyses is exactly why I published my book and my blog posts. Pal review can not be considered independent. Climate scientists should openly debate skeptics but they have circled the wagons, and refuse to debate. Government funded scientists like James Hansen, Kevin Trenberth and Gavin Schmidt have told the research community to avoid debating skeptics arguing "it only gives credibility to alternate hypotheses". They have squashed any internal skepticism by labeling skeptics the biggest threat to the earth. Climategate emails show that climate scientists undeniably tried to prevent access to data and discussed plans to circumvent FOIA requests. It was skeptics taking to the blogosphere, free from the pressures of Trenberth and his ilk, that exposed much of the problems with how data has been presented. All the fears about potentially hiding and controlling climate data by Trump has already been happening for over a decade by climate scientists. When skeptics pointed their actions out, those tactics were eagerly defended by the CO2 believers. As this thread intended to highlight, climate scientists have been trying to delete the mid 1900s warm blips, as they also tried to get rid of the Medieval Warm Period. This current hype is more like 1984 double speak. As Maya Angelou warned, "When people reveal who they are believe then; the first time" . Pyrrho wrote: Removal of publicly-funded climate data appears to be a valid concern. Word now is that US government scientists must submit their work to politicians for review before it is published. The need for independent data collection and subsequent independent analysis thus becomes more crucial and essential. If the agencies become privatized, it becomes that much more essential.